It’s the beginning, of the end, of the beginning. 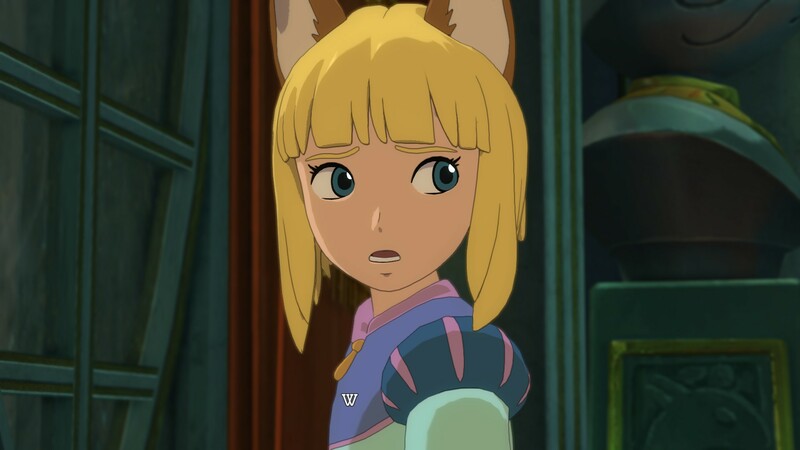 Confession time: I did not complete Ni no Kuni 1. 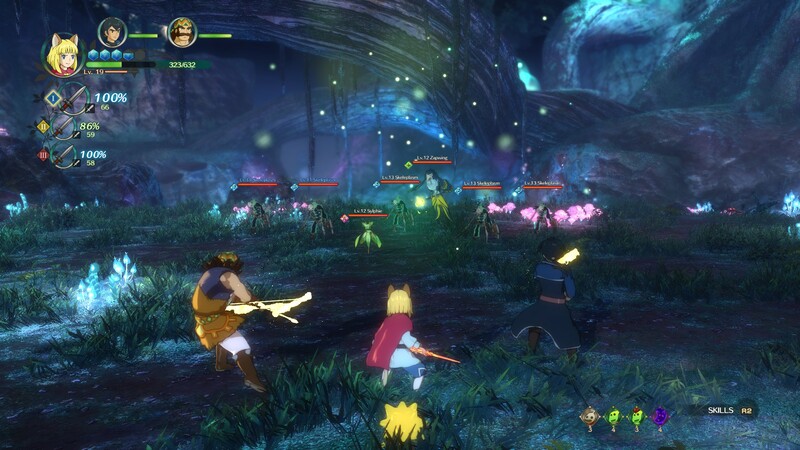 Yet Ni no Kuni 2 has been one of the most compelling and engaging RPGs that I’ve played in quite a while. 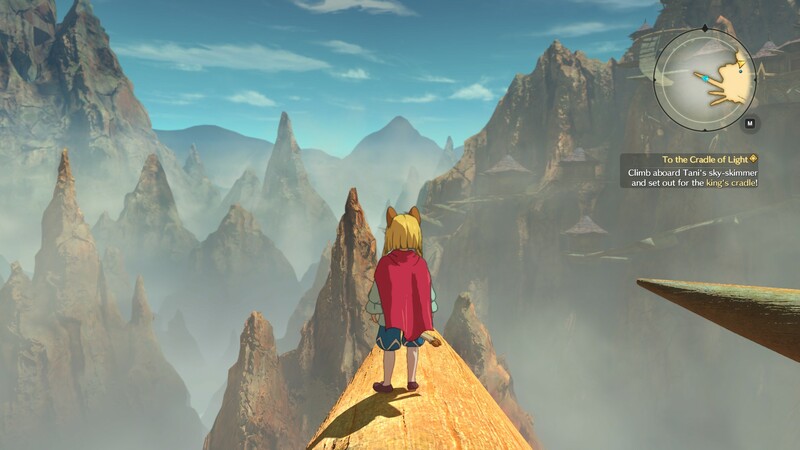 It does offer up a lot of standard JRPG/Anime/Fantasy tropes for the plot and why we’re doing what we’re doing, and I’ll do my best to avoid any spoilers of the major plot points, but even with that, I’ve quickly fallen in love with this world. Part of it may have been that it has that Studio Ghibli feel that many anime fans (myself included) have come to know and love. There are Studio Ghibli members in the game’s credits, so while the game may not have the Ghibli name on the cover, it certainly conveys the storytelling magic the studio is known for. Evan might be a dork, but he’s our dork. Evan, one of the main characters, also has cat ears, suggesting that somewhere along the line these two races interbred or magic occurred. The Kingdom where he was the Crown Prince fell under siege by an evil group of Mice, and at the same time, a President in our world, Roland, somehow found himself mixed up in this realm of adorable anthropomorphic creatures and humans. The evil faction claimed the king’s “Kingmaker”, which is a massive beast that defends the realm and is the proof of nobility. Each of the major kingdoms has one tied to their king. It’s a very desirable power, and a kingdom without one cannot function. Evan escapes thanks to his friends, and now is trying to set up his own kingdom and bring peace to the land. 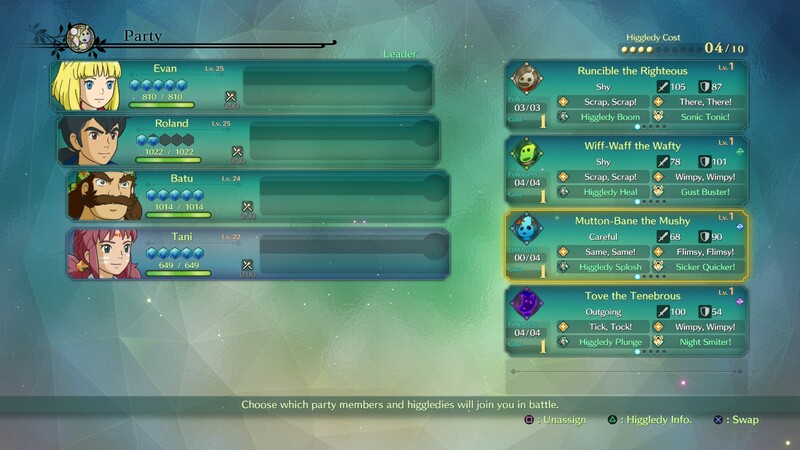 There are several differences from the original Ni no Kuni, such as familiars being replaced with Higgledies (which results in combat engine changes) and no transporting between worlds. Instead, we have a Kingdom to run, which will take up all of that time you’d normally spend in a more modern setting (and then some. Trust me, I’ve been absorbed in Kingdom building). 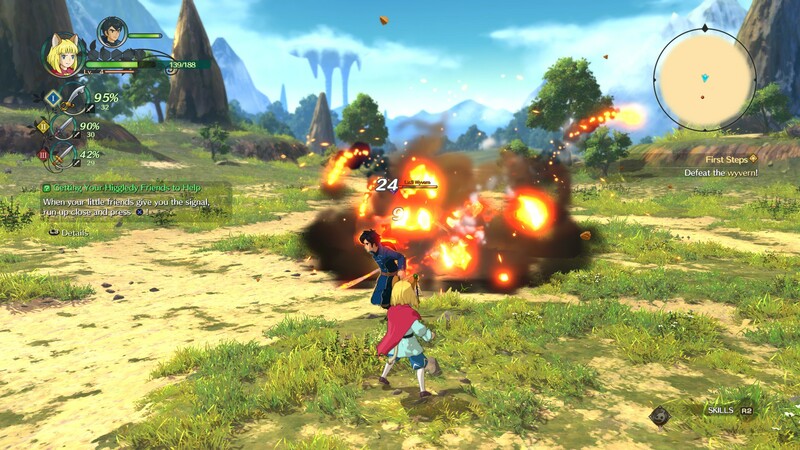 Ni no Kuni 2 is a JRPG with a fairly mature setting, showing us the vices that come with power, the bonds that hold people together, and bonds that are torn apart. I’ve been absolutely engrossed in this story and none of the major characters have felt boring or flat. The game shifts between action RPG, Kingdom Simulator, and RTS, because now that you run a kingdom, you’re going to need an army. 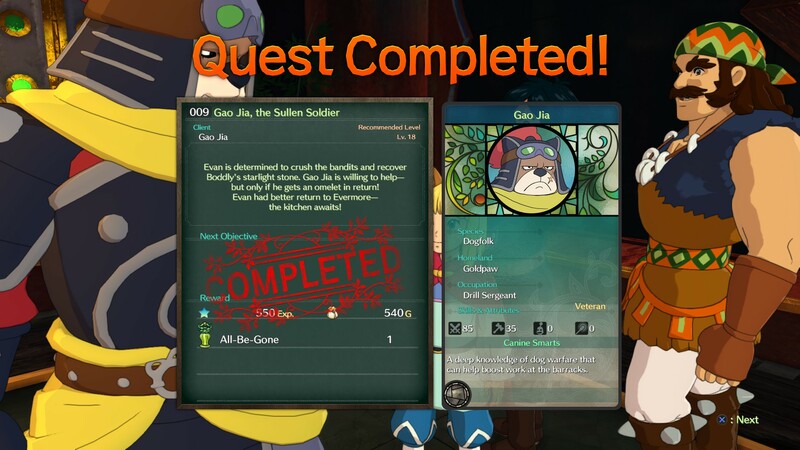 Ni no Kuni 2 on its own is not an insanely challenging game, but there will be points where you’ll be glad to be a little overleveled or have rare gear from random encounters (which is conveniently color-coded). Though you start off with only two characters, you’ll meet several more friends to join your battle, and you’ll have to decide which three you want to run with, depending on what you need. When you’re in an area/dungeon, combat happens immediately. You see the enemies in real time, and if you damage them with your attack buttons before they see you, you get a slight edge. You have two attack buttons (Light and Heavy), Jump, and your Skills/Spells are done with a combination of two buttons. You can’t spam them though. You’ll see blue gems above your Health, which fill up by attacking enemies. 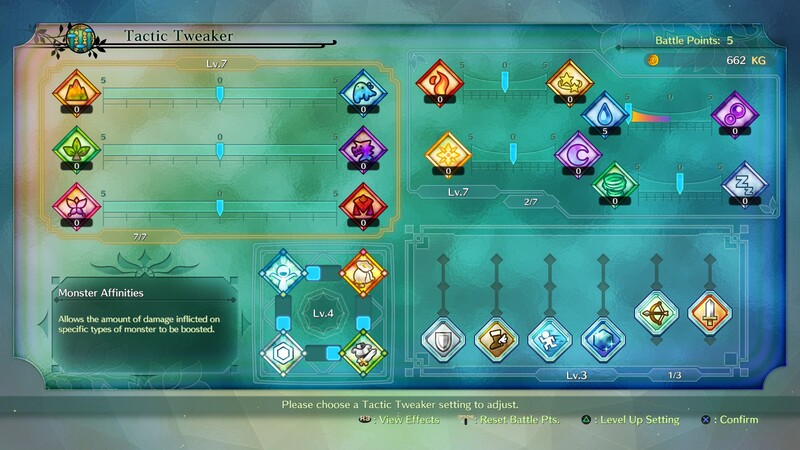 Each of these is a Mana Point, and skills require a certain amount of MP. You’ll also receive early on the “Arm Band”. It lets you equip multiple weapons, up to three melee strikes and one ranged. You’ll see all of them in your main UI, and as you attack, you’ll build up a meter, known as the Zing Meter. 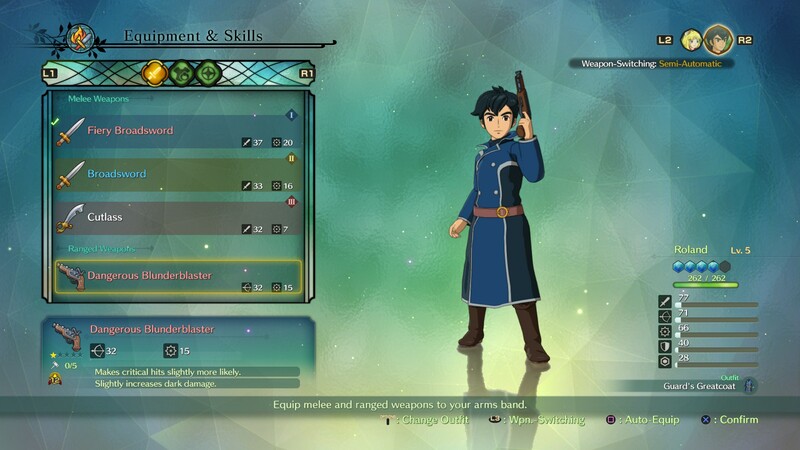 When you use a skill, this meter resets for that weapon but having a Zing Meter at 100% can change properties of skills that are used. Equip three weapons, swap at your leisure, and make your opponents explode! To make this easier, you have three settings (Auto, Semi-Auto, Manual) for swapping weapons. Personally, I use Semi-Auto. When I use a weapon’s Zing Meter, it will swap to the next weapon, taking a little of the busy work out of it. If you’re in Auto, it will do all of the management for you with your meter and in Manual, of course, you do it all yourself. I’ve had a lot of luck using Semi-Automatic, personally. You can control whichever character you want, and if they die, you will take control of someone else. The AI has been in my experience very solid and didn’t do ridiculous things or waste items. Combat was ultimately very easy to approach, and I learned that many enemies can be afflicted by status ailments, or outright stunned if you interrupt their skills/hit them at the right times. Higgledies can really save your bacon in a pinch. Familiars are out though, and you receive new allies in battle, the Higgledies. They’re adorable little mana creatures that come in groups and run around in battle to help you with Passive Abilities and Active Abilities. Each has its own personality (Shy, Outgoing, Brave, et cetera), and an element attached to them. You don’t control them directly, but they will do what they can to help you based on their personality. You don’t want all shy/cowardly Higgledies and should try to balance them out with Braver personalities to keep them in line. When it’s time for them to use their special powers, they’ll have a ring on the ground, and you’ll run up and activate them. I have seen them use those powers without me doing it, so I wonder if your AI partners do it for you? Whatever the reason, the Higgledies can be powered up in your kingdom, and there are lots of ways to find them, from hidden locations to conjured in a pot in your kingdom. 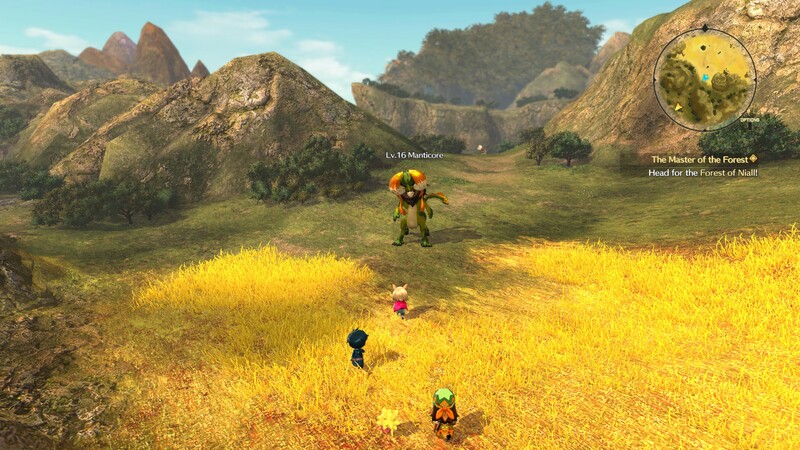 The chibi look of the overworld is so damn adorable. There is no transition for battles when you’re on the world map, you change down to a chibi (small, cute character) and the enemy packs are also represented the same way. Running into them will initiate a battle, and like in dungeon encounters, there’s a ring around the fight where you can run away from if the fight is too hard. There are one or two (on average, for a first-run through an area) gigantic, high-level monsters tucked out of the way on many of the maps. There’s nothing special about them, they’re just strong. You can tell because an enemy that’s probably out of your range has a red-colored name and the weaker ones are blue colored. There are also special monsters in the world who have a glowing purple aura. These are notorious, powerful monsters that have bounties on them. Even if you are the same level, do not engage these! They are ridiculously strong, and I tend to come back ten levels higher and even then, exercising caution. The ones for side-quests were a little easier, but overall, these are powerful, dangerous challenges to overcome. Tune your strengths and weaknesses to any encounter! DO IT. The Tactics Table is one of the ways you can make the game just a little bit easier for yourself. You’re given it in the course of the main story, and as you win battles, you’ll gain Battle Points. Battle Points level up the Tactics Table in one of several ways, and the higher the level, the more points it costs. You can change “Spoils Settings” “Monster Affinities”, “Elements and Ailments”, and “Arts of War”. Each of these has a slider that makes you pick one type or the other, except Arts of War. Fortunately, you can tune several different sliders for whatever you need at the time, and their titles are very self-explanatory as to what they offer you. You don’t have to use this if you don’t want, though you’d be absolutely foolish not to. The other part of the game that lets you increase your power is the Kingdom Building system. You start with a very tiny kingdom, barely a village. As you grow and add buildings, you can learn new spells and techniques, improve and craft new equipment, receive free random items, and increase the power of your military. You can have farms, a training center to increase EXP from battle, and so much more. There are dozens of plots of land to fill, and it uses a separate currency, KG (Kings Guilders), instead of normal Guilders. You gain these as the game is turned on, so if you want to idle for them you certainly could. There’s a cap to Spoils (random, useful items) and KG that you gain this way, so keep an eye on it. Everyone wants to join your kingdom. But they all want something. . . Recruiting villagers is incredibly important, and when you come upon them they’ll have some manner of sidequest for you to complete. Each has a use and specialty, so attach them to the building they are best suited to. Occasionally they’ll ask you to fulfill another duty, which will help you learn more about them and give you (and the kingdom) more resources. I found myself investing as much time in this as the main story, and would often take breaks from the action to go home and adjust what my kingdom was doing. You can level up buildings, research new things, and a lot of this stuff takes time. Were this a mobile game, this would be where the money-scheme would take place. Thankfully, that’s not the case. You can gain incredibly useful stuff here if you simply take the time to explore it. Sometimes it will be required, like the Military Force. 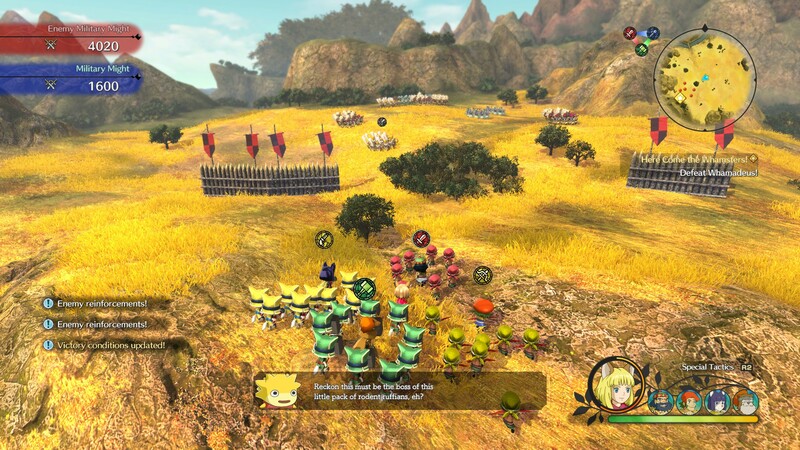 Total War: Ni no Kuni. There is the odd banner standing on the world map, which represents a military battle. Activating it will give you the name of the battle, and what level it suggests. This is not your character level, but the level of your military characters. You can have up to four equipped, and the units will surround your main character when in these RTS situations. You can rotate them around you, and there’s a Rock-Paper-Scissors system in place (Red, Blue, Green) for melee units. Ranged Units are yellow always. As you kill and have units killed, Military Might will decrease, and running out will spell Game Over (puts you outside the battle). You can use some of the Military Might on special abilities and to refill lost units. These battles have phases and requirements to win, and are pretty damn challenging. Taking over enemy fortifications like cannons will be key to winning many of these battles. This system will be a part of the main story quest in a few places, so it’s highly advised to spend some time playing with it and making a decent military force out of it. That’s the only way the military characters level up, after all. One of the best parts is that you do not have to train/recruit troops. They magically refill at the end of a battle. There is one thing that really frustrated me and it had no reason to: Items. You’ll see sparkling items all over the world, in cities, dungeons, on the world map. They’re free items of varying usefulness (pebbles, cloth, food ingredients), and that’s wonderful. What’s infuriating is they respawn after battles. So I find myself going back to collect them over and over. It just took up so much of my time and I realize it’s a silly thing to be frustrated about, but I most certainly was. 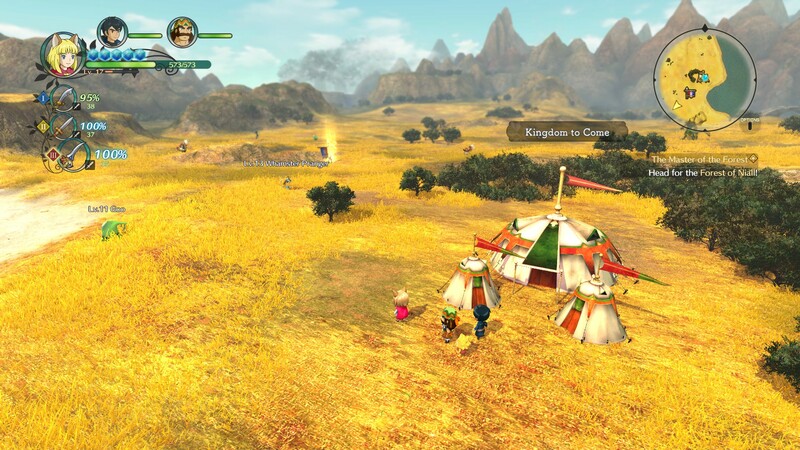 Ni No Kuni 2 does encourage you to go back to areas more than once. It’s such a vast world, and you’ll find that there are parts of zones you cannot go to, though you can come back in a while with a new spell and explore these spots. This is made easier with the Travel Doors, represented by blue energy you can activate, which creates portal waypoints. So while the story is fairly linear, you can always go back and find new things, and many sidequests will take you back through old spots. I had such a hard time narrowing screens down: Either they are embargoed, or there was something else that fit too. I don’t give very many 5s, and for good reason. 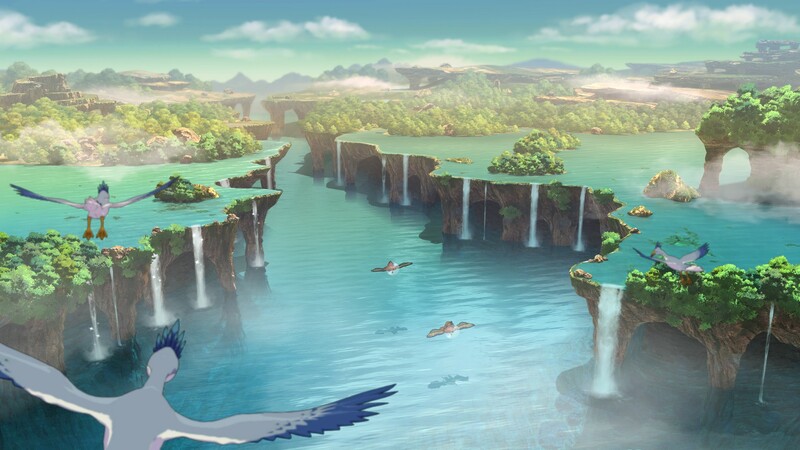 It takes a lot for me to think a game is truly that spectacular, but Ni no Kuni 2 fits into that category. Even if you set aside the gorgeous music, the absolutely stunning graphics, the interesting characters, and lovely setting, this has a story that is far deeper than the adorable graphics might indicate. There are so many things I did not talk about either because there are secrets I uncovered or things that will be explained in the tutorial. It even has its own form of social media with Leafbook, where people in the world comment on things you’ve seen and done. Clever wordplay, a story that has me on the edge of my seat, plenty to see, do and learn. I can see each playthrough of this game being approached in a different way, from characters, skills, and order of operations in the Kingdom building. There are definitely differences from the first game, and all it does is make it even more appealing. 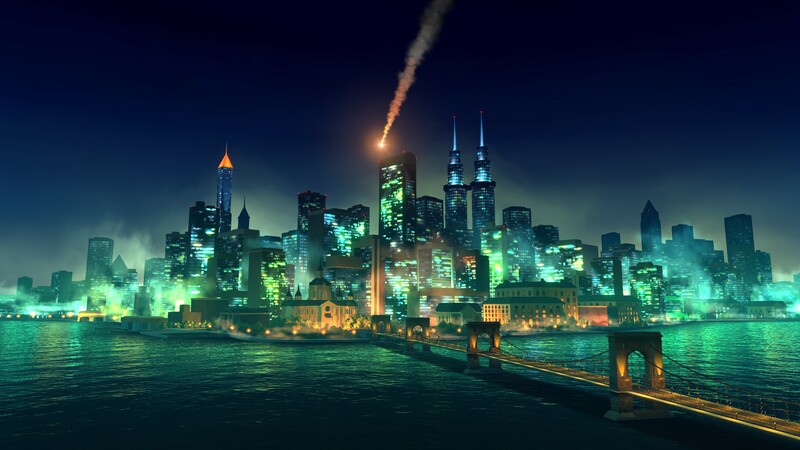 I have not been this captivated by a JRPG since my youth, and I love that feeling. It takes me back to when I was much younger, just presented in a much prettier, more accessible way. I still have so many questions about the world, and its secrets, and I’m looking forward to uncovering them. Ni no Kuni 2 being on Steam is also a godsend, giving more people than ever the ability to play an incredible game.